Welcome to Jon Scieszka's Trucktown, a brand-new preschool/kindergarten series that will come in more shapes, sizes, and formats than you can shake a bumper at. It's a world where all the characters are trucks, all the stories are action driven, and boys and girls can imagine themselves in all their crazy, loud, funny, creative, excited, full-throttle glory! It's a world where we work at play, and we play at work...and no one's afraid to get dirty or be LOUD! And it all kicks off with Smash! Crash! 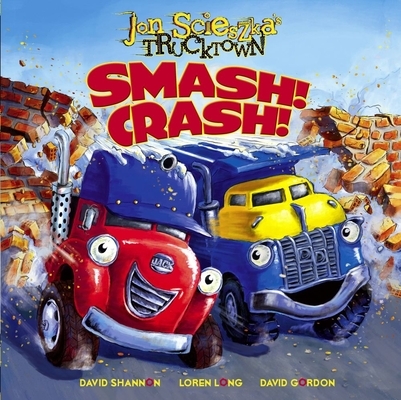 Best friends Jack and Dan are spending their day doing what they do best - smashing and crashing! All the while a strange shadow is following them around every corner...Who is this new addition to Trucktown? What does she want? Rhythmic, rollicking text will get kids' motors running and horns honking with each refrain! This is a book that begs to be read again and again!